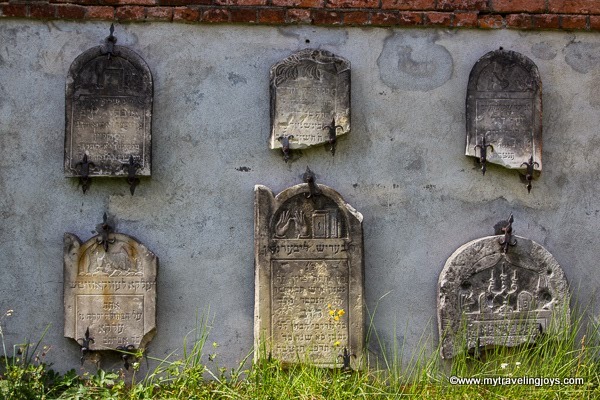 I stared out at the rows and rows of haunting tombstones at the Jewish Cemetery in Łódź, which was Poland's second-largest Jewish city before World War II. I wasn’t prepared to feel so sad and devastated about seeing a cemetery where about 160,000 people are buried. But the Jewish history in Poland and in the rest of Eastern Europe is a tragic one. The Jewish Cemetery on Bracka Street, established in 1892, sits on 40 hectacres (about 100 acres) and seemed enormous to me. In one section of the cemetery called the “Ghetto Field,” there are about 43,000 victims who died while they were living in awful conditions in the Jewish Ghetto in Łódź during WWII. In total, about 90,000 people have been identified, and the cemetery keeps a database of all the names that they have. Many parts of the cemetery are covered in tall weeds, rambling vines, decaying branches and green moss. The farther you wander from the main entrance, the more overgrown and wild the cemetery becomes. 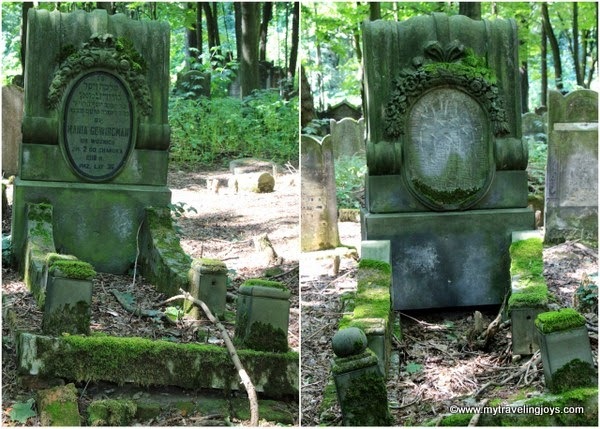 Fragments of tombstones lay on the greenery-covered earth. The engravings are faded. I was lost in my own world, taking photos of the crumbling tombstones and continually questioning, how could the Nazi Germans have treated the Jewish people so horrendously? In the 18 months that we’ve lived in Poland, I’ve read countless fiction and non-fiction books about WWII and Poland. I still cannot understand it. It’s not something I CAN understand. To me, seeing the Jewish Cemetery in Łódź was almost as poignant as seeing Auschwitz-Birkenau concentration camps in person. I left with tears in my eyes. Entrance and car park on ulica Zmienna. 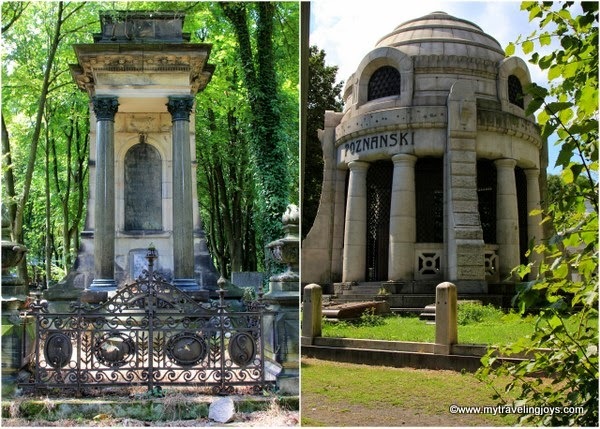 Surprisingly, there were several fancy mausoleums like these located on the right side of the cemetery. I'm assuming these families must still have living relatives since the grounds were so well maintained. Good morning Joy! Love these old graveyards for all the wonderful flora and fauna that always seems to thrive in them - mostly undisturbed places and well supplied with nutrients. Super photos that I enjoyed spending time over. what a beautiful place but so sad. i felt the same way when visiting the camps. Thanks Alan! I appreciate your comments. Most of this cemetery is totally undisturbed. It's almost eerie in a way. Exactly. 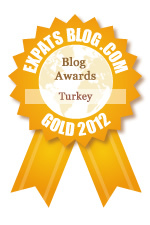 ..I felt even worse after seeing the concentration camps, but the cemetery was very sad too. My husbands mother knew all too well about the cemeteries, she is polish jewish, she was fortunate to escape but their was a sadness about her and her life her entire days..I could not bring myself to walk in any of those cemeteries to know other human beings tormented, tortued and killed other human beings no I could not..My familia lived in CUBA they lined them up my relatives who were educated and when they asked if they wanted to be communista they said no and shot them in front of their other relatives, no thank you for ever visitng CUBA...I cannot imagine living in a country or countries where if you are born a certain race you are doomed to near annihilation and now some in Germany say it never happened really really??? I don't think so..history cannot repeat itself for all to know the inhumanity to man that truly did happen..
this is one of the reasons why I really would love to go to Łódź and see it properly! 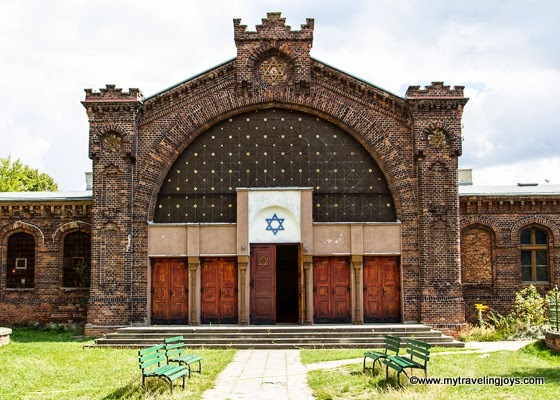 I really like the Jewish Cemetery in Warsaw but I think the one in Łódź is even better! @Kami, I can definitely recommend this cemetery. Worth a moment to walk through here...such a big part of Poland's history that wad nearly erased! Welcome to October in Warsaw!